Postponing travel plans, to work on other projects, seems like a bit of a theme for us these days. Since we're clearly obsessed with travel, (enough that we've dedicated an entire blog to it) you'd think that we'd be upset... but we've been enjoying some of the other things that life has to offer and thinking about how we can travel in the future so that it includes more time for volunteering or community outreach - which we didn't discuss here previously because I didn't want to be a downer. The summer has been good to us. Long evening bike rides, kayaking, and dinners with friends has made the season even better. We intend to stay in Montreal and enjoy the weather while it's nice, with plans to travel in the winter. We realize that Pinterest is usually used to save random inspirational things, but I thought it might be an efficient way to gather resources for travel. It's more visual (read: prettier) than just having a bunch of boring bookmarks. It's also a lot easier to share - we can just direct people to our board if they'd like recommendations. I've been meaning to make one for our favourite Montreal spots for all the people who ask us what they should do when they come here. If you've got any travel related boards that you think we should see, feel free to share them, or if you feel so inclined, send us links to your blogs or articles about places you think we'd enjoy - especially if you've had a good experience. 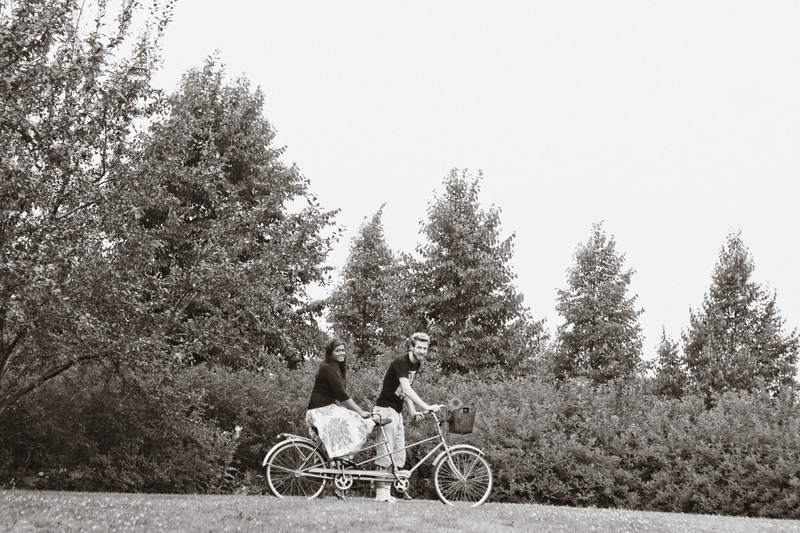 Awhile ago, Rhianne wrote a bit about us for a Lomography Magazine article. It's been ages since we've used our lomo cameras, so this was a nice reminder to dust them off and take them to play outside. If you'd like, you can see all of our lomo + film photos in our flickr set. i was just thinking about your blog yesterday because we're planning a long trip and it's hard not to let things add up quickly. i wondered how you guys budgeted for so long. can't wait to hear about your future trips. my husband and i are also tumbleweeds. we have lived in lots of different places, and currently peru. we love to travel. love your adventure. but it's always important to remember to be happy where you are and with whom you're with. life has so much to offer! Seeing Paul in concert is #1 on my list of things to do in life. Dramatic? Maybe. [but I like to think not] If I had the funds, I'd be all over this. Ending with the Abbey Road medley is perfect. Y'all are so lucky to see this!! My husband and I are going to see Paul at Wrigley Field in Chicago. I'm as excited as you are to see him. We had an extra ticket so I invited my mother-in-law. I called her and asked her if she wanted to go to a concert with us on August 1st. She said sure, who are you seeing. I giggled and told her Paul McCartney. She got really quiet and then started crying. It's going to be special. Hopefully it won't rain on either of us! I don't think I could make the Montreal show, but it sure is tantalizing, since I've had a crush on the man for 40+ years. I do believe the song that you have based the name of your travel blog on - Sending Postcards - "Two of Us" is just prior to the Wings era. Ooh, I forgot...can you please explain to me what lomography is? 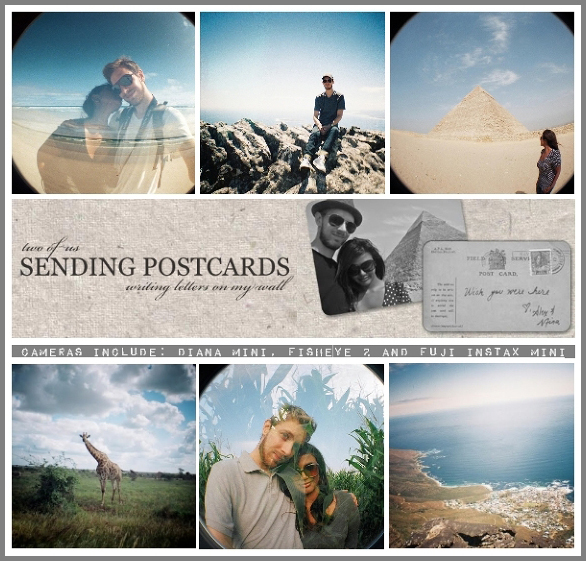 I've joined their site, but don't really understand what is so special about analogue photos. I'd like to know more about it before I invest in a camera. Have fun at the concert!! I second Eva's comment, great name for it! Glad you all are enjoying some home time, and Montreal is so gorgeous...lucky you getting to see Paul!! I've missed your posts!! I was always living out my travels vicariously through you guys! 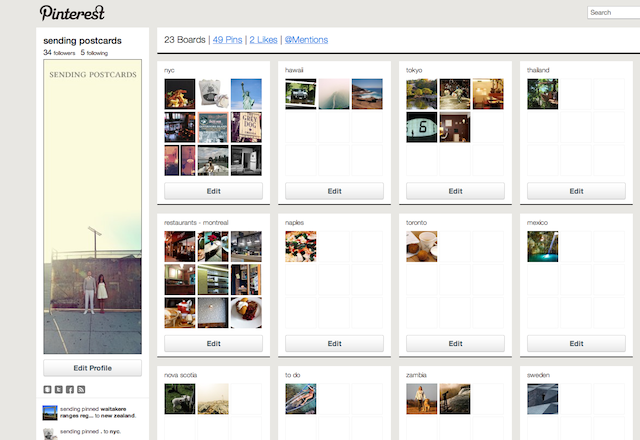 Thats a great way to use Pinterest, I love it! LOVE the GIF up top--so funny! Have fun at Paul McCartney! Random: Dave met him in the elevator at work a few months ago. So happy to hear from you! Please let us know if you'll be somewhere in South America in November and December! Would love to meet and perhaps climb a volcano!! When you mention considering volunteering and community outreach it gets me excited to think of what a big impact on the world the both of you will make. Can't wait to read more about it all. You mentioned being more involved, have you thought about volunteer vacationing. You get to fill your travel desires and give back to the communities that you visit. Just a thought. I need to financially figure out how to be a tumbleweed. Hi Mina, you can check my blog which is about travel for different options including quite a few in India.